The Capitals had to battle back each goal the Bruins scored. So the Bruins scored in the overtime period and didn't give the Caps a chance to come back. Tyler Seguin, mostly quiet for the series, nets a game winner in overtime and the series will go to a deciding game seven back in Boston. "Any experiences you get in the playoffs, it just adds to you," Head coach Dale Hunter said of his team going into a game seven. "You know what to expect. Game 7s are exciting games because it’s do or die for both teams and they’re awesome to play in." Mike Green got his first goal of the series. Jason Chimera and Alex Ovechkin also scored for the Capitals. Braden Holtby still played admirably but came up short. In a game that each team exchanged goals it would be the Bruins with the overtime winner after a Nick Backstrom give away in the neutral zone. Just 3:17 in the overtime period and Seguin forced a game seven. "It’s tough, but we still have a chance on Wednesday," Backstrom lamented. "We are just going to refocus and play our best game in Boston." 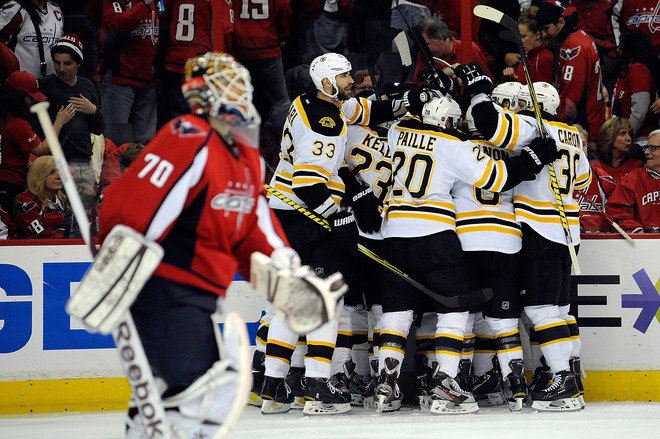 The Caps looked to close out the series at home taking the Bruins to the brink of elimination. It looked as if they might be able to do it early on, getting a slew of chances on Tim Thomas early. But the Bruins had a counter attack and a point shot tipped in beat Holtby to give the visiting team the early 1-0 lead. Green would score just under 4 minutes later as the Caps kept a good forecheck going on the Bruins. He had an earlier chance but missed the shot wide. His point shot looked as if it would also go wide, but it deflected in off of a Bruin defender's shin and in behind Thomas to knot the game up at one apiece. The Bruins would get a late period goal from David Krejci who scored on the power play. The Caps would answer in the second period when Backstrom found a streaking Chimera breaking to the net. a simple saucer pass found the mark and Chimera scored his first goal of the series to tie the game up at two. The Bruins again would get the lead midway through the third period when Andrew Ference followed up a broken play and pounded the loose puck in. It looked as if the Bruins put on the shut down mode to their defense and Ference would go home with the game winner. But the Caps would answer with under five minutes to play. Off the faceoff, Backstrom won it back to Ovechkin who tapped it off his skate to his stick and beat Thomas five hole to tie the game up at 3. The Caps special teams were both a shining moment and a hindrance. Their penalty kill continues to impress. Even though they allowed a power play goal now in two games, they did kill off a lengthy 4 on 3 while Ovechkin sat out for taking a double minor for high sticking. "They didn’t get much at all, especially on the 4 on 3," Holtby said of the effort of his penalty kill. "Even when they tried to shoot we were in the lane every time and that’s hard to do on a 4 on 3. It was good, that kept us in the game." It even gave the Caps a little momentum in the second period. But they were 0 for 4 on their own power play. At times they could have taken the lead with the man advantage, but the power play unit often looked disjointed and sloppy at times. Game seven will be in Boston on Wednesday night. Both teams will take the extra day off to rest up as both teams prepare for a do or die situation. The Caps just have to keep doing what they are doing, playing stingy defense and making the most of their chances when they get them. "I’d have to answer that it’s fitting for us," Claude Julien, Bruins bench boss said of taking the series back to Boston. "When you look at the way the series has been played, you’re right; it’s been a dog fight from start to finish." All six games have been decided by one goal. This is the first time in NHL history that the first six games of a series have been one-goal contests. Green tallied his first goal of the playoffs and the sixth of his career. He is now tied with Sylvain Cote for seventh place in goals among defensemen in franchise history. It is also his first goal for the Capitals since October, Green has missed 50 games with a groin and concussion injuries. Caps out blocked the Bruins 12 to 9.